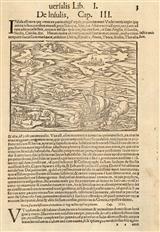 Description: An illustrated definition and description of islands, from the seminal 16th century work, the 'Cosmographia'. Description: Illustrative and theoretical map showing numerous cartographic and geographical features and styles. Original colour. Description: Based on the observations of Dampier, this map shows the transient courses of trade winds. Coloured. Description: Map illustrating the trade winds, showing the incomplete coastline of Australia. Coloured. Description: Thematic world map showing the international scope of the Islamic faith. Original colour. Description: This iconic caricature depicts Napoleon Bonaparte and William Pitt carving up the globe in the midst of the war between England and France. Pitt's fork is fashioned in the form of a trident as it pares half of the globe away; taking the lucrative West Indies. Napoleon's fork is fashioned as a bident - associated with Pluto, ruler of the Underworld - and it dives through Hanover, birthplace of the British Monarchy as he cuts Europe away from the steaming pudding. Exceptional original colour. Description: Elegant map of the world as known by the ancient European civilisations. Coloured. Description: Interesting depiction of the World as perceived at the time of Herodotus in the 5th century BC. 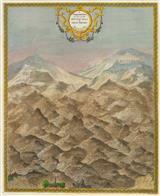 Description: Unusual aquatint showing the Empire of Charlemagne. Original Colour. Description: Curious map detailing the principal rivers of the World, showing courses, countries and comparative lengths. Original colour. 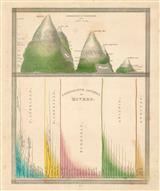 Description: Beautifully illustrated, scientific comparative chart showing the heights of mountains and lengths of rivers across the world. Description: Victorian table showing the different scales used to measure distance from around the globe.